3 x 4…20 mA, HART®7, FF, Profibus-PA/DP, Modbus, PROFINET etc. 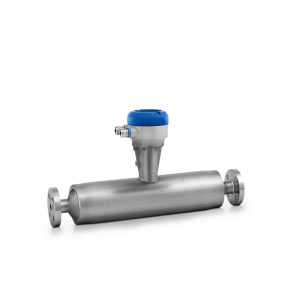 The OPTIMASS 1400 is a cost-effective twin straight tube Coriolis mass flowmeter for a wide range of standard applications with gases and liquids (up to 170,000 kg/h or 6,235 lb/min). 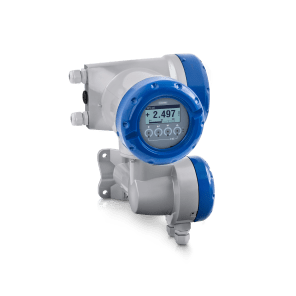 The meter features Entrained Gas Management (EGMTM) for liquid applications, providing reliable readings even in the event of gas entrainment of up to 100%. In this way, the Coriolis meter enables continuous and uninterrupted measurement of volume flow and mass, density and temperature – even at difficult process conditions with 2-phase flow. The OPTIMASS 1400 features an optimised flow splitter for minimum pressure loss and can be drained and cleaned easily. Next to flange process connections it supports a wide range of standard hygienic connections for food and beverage applications. Like with all other KROHNE Coriolis mass flowmeters there are no installation restrictions as the OPTIMASS 1400 is immune to crosstalk/line vibrations and can thus be installed in series or in parallel. It is also approved for use in hazardous areas. 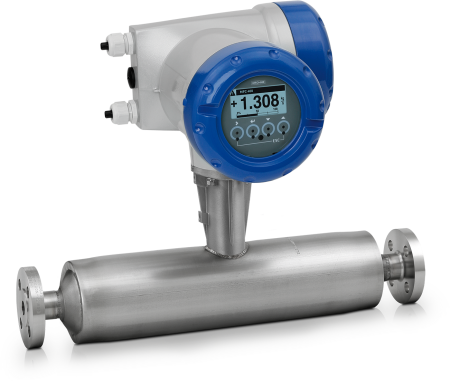 The Coriolis mass flowmeter provides enhanced diagnostics (NE 107) and comes with various digital communication options. Portable installations on trucks, rail tankers, portable rigs etc.